Superalloys are the wonder materials of metallurgy. By fine-tuning their composition, scientists can increase mechanical strength and improve resistance to corrosion and high-temperature shape changes. A*STAR researchers have shown that adding nanoparticles can make these materials even stronger. Inconel 625 is a superalloy that is 55-70 per cent nickel with added chromium, molybdenum, iron, niobium-tantalum, plus trace amounts of numerous other metals. Inconel 625 is used in industrial marine applications because of its high corrosion-fatigue strength, tensile strength and resistance to chloride-ion stress-corrosion cracking. Guijun Bi and co-workers from A*STAR's Singapore Institute of Manufacturing Technology and Institute of Materials Research and Engineering have reinforced Inconel 625 using titanium diboride nanoparticles. The improved superalloy is fabricated by a sophisticated technique known as laser-aided additive manufacturing. Additive manufacturing is a class of fabrication methods that can create full-scale components by building them up one layer at a time. 3-D printing is one well-known example, but for metals, high-power lasers are typically needed. 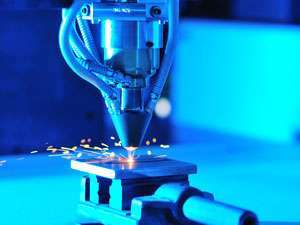 One such method is laser-aided additive manufacturing, a novel additive manufacturing technology which can be utilized for 3-D printing, surface modification and repair. It works by applying a laser beam as heat source, with the additive materials melted and deposited on to the surface layer by layer. "We show that adding nanoparticles to the metal base material is an effective way to tailor the material with significantly improved physical, thermal and mechanical properties, as well as excellent performance in terms of wear and corrosion resistance," explains Bi. Bi and the team mixed and ground together an Inconel 625 alloy powder and a titanium diboride powder with particles approximately 58 nanometers in size. Their additive manufacturing system comprised a powder nozzle on a six-axis robot along with the output from a high-power fiber laser. In this way, they were able to create one-millimeter thick layers of their material on a carbon steel substrate, which they built up into a rectangular block of 120 × 70 × 10 millimeters. Analysis of their sample indicated that the titanium diboride nanoparticles mainly aggregated at boundaries between crystalline grains of the Inconel 625. Thus, the titanium diboride acted to reinforce the grain boundary. Mechanical testing of the sample demonstrated a significantly increased material strength, relatively high micro-hardness and good abrasive resistance. "We hope to develop this approach and explore new composite materials reinforced with nanoparticles for additive manufacturing" says Bi.